After an unforgettable battle with Jose Hernandez in December last year and a technical knockout win over Marcos Herrera this past February, unbeaten Michael "The Artist" Perez is quickly becoming a fan favorite on the boxing rich island of Puerto Rico. Cestus Management's super middleweight destroyer Don "Da'Bomb" George made the leap from boxing prospect to being on the verge of becoming a world-class contender with a four round savage annihilation of Canadian Jason Naugler; handing this tough and very experienced fighter his first loss byway of stoppage. 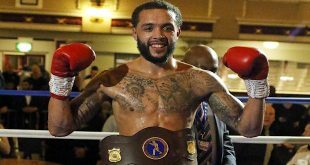 Finishing up a lengthy training camp over the last couple of months, Chicago’s Donovan “Da Bomb” George is “primed and ready” to take on Canada’s Jason Naugler tonight, in the ten round super middleweight main event at "Windy City Fight Night 7" at the UIC Pavilion.